The National Theatre's new season in May will present six shows exclusively written for the stage by men. Only one of the six will be directed by a woman, with Amy Hodge taking the reigns on Andy Stanton's Mr Gum and the Dancing Bear. This is in spite of the National Theatre's commitment to have 50:50 gender representation for directors and living writers by March 2021. "The National Theatre is fully committed to reflecting the diversity of the nation on stage, and has set clear targets for increasing representation," said National Theatre Director Rufus Norris. "The shows going on sale in our upcoming booking period only reflect a portion of the work currently playing or coming up on our stages." 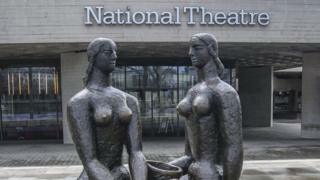 The National Theatre has come under heavy criticism online for the announcement, with theatre director Sara Joyce calling it "a joke". The National Theatre's new season will include Jellyfish by Ben Weatherill, Hansard by Simon Woods, Translations by Brian Friel, and Master Harold and the Boys by Athol Fugard. Meanwhile, The Secret River has been adapted for the stage by Andrew Bovell from a book originally written by Kate Grenville. Daisy Cooper, a theatre producer based in London, told the BBC that the National Theatre's announcement was "disheartening". "I have a huge amount of respect for the National Theatre," she said. "It felt disheartening to see a season announcement where there was only one female director listed." Image caption Daisy Cooper wants opportunities for the "wealth of talented female directors and playwrights"
The 33-year-old called Ms Hodge "brilliant" and said she was "thrilled she's going to do a show at the National". "But the National Theatre has a widely publicised gender target," she said. "The past couple of years it feels like the announcements that come out have been disappointing. "I'm a member of a group that doesn't have as much representation in literature or theatre, and we're over half the population. "It's frustrating to continually feel let down by the work that my industry leader is putting out there. "Last year the National's Olivier Theatre premiered more David Hare plays than plays by living female playwrights." This refers to a popular social media post from October 2018 which listed all of the shows that have played in the National Theatre's Oliver Theatre. Madelaine Moore, artistic director of The Thelmas theatre company, told the BBC that she did not expect the National Theatre to meet its target of 50:50 gender representation by 2021. "It's just not happening," she said. "There are so many emerging female writers out there, but I don't think I've seen any change [in attitude] in 10 years. "For the National to programme a season with one female director and no female writers is a joke as far as I'm concerned. "They need to stop talking about [diversity] and just commission women. I feel like they're not catering for us. "The other thing is, it's become this binary of male and female, when actually there are lots of non-binary and trans artists out there who aren't being represented. "It's about whose stories are being told and who are telling these stories. It's 2019, we need to be on it with representation." In response to the backlash on social media, Mr Norris cited several shows that showcase female talent. "On the South Bank are works by Caryl Churchill, Githa Sowerby, Helen Edmundson and Ella Hickson," he said. "While in the West End Nine Night by Natasha Gordon has just ended its run, and Laura Wade's Home, I'm Darling is playing before touring across the country. "It will be followed on tour by Shelagh Delaney's A Taste of Honey. The majority of those productions are led by female directors. "Later in the year there will be more plays by female writers in each of our three theatres on the South Bank." Others made this point on social media, suggesting that over the course of the year it might balance out. But people have called the announcement a contradiction, pointing to Mr Norris's previous call to "publicly name and shame to achieve gender equality".